The Seattle Georgetown neighborhood is celebrating the holidays in grand style! We kick off the evening with a tree lighting ceremony on Saturday, December 8th at 5:30 pm (Airport Way S &13th Ave S plaza, next to Ground Control). With the Choir of the Sound wandering carolers, hot cocoa, art receptions, live music and holiday parties, the Art Attack art walk will be THE holiday event everyone will be talking about. All Aboard the Art Ride! Whether its the rain or sore shins that slow you down, the Art Ride bus is ready to whisk you off to your next Georgetown destination! Bus stops are listed on the Art Attack postcard map, and run the loop of Airport Way S to Equinox Studios and back, and best of all… it’s free! All City Coffee presents “Little Bits and Pieces”. Follow All City Coffee in merry measure as they present small and affordable works by several local artists, including Alex Achaval, Zak Alexander, Sullivan Giles, Jesse Link, Caroline Roosevelt and Catherine Cross Uehara. American Pie and Bakery will present the work of Mirka Hokkanen (intaglios, etchings and other prints) and the serene shadow boxes of Ellen Miffit. Calamity Jane’s presents “White Collar Hero”, mixed media paintings by Don DeLeva. Equinox Studios is hosting their annual World Famous Holiday Open House! Live music, poetry interludes, blacksmith demos, refreshments, and more! Take the Art Ride and make this your stop for the evening! Artists: Alair Wells, Alex Miller, Amar Delgar, Andy Blakeney, Betty Jo Costanzo, Chas Guidry, Colin Stevens, Craig Howard, Dan Morgan, David Weeks, Derek Voss, Gail Howard, Garth L’Esperance, Gini Lawson, Jacob Bain, James Ryan, Jason Gregory, Jeffrey Olhoeft, Joel Kikuchi, John Kirschenbaum, Julia Heineccius, Julie Bergen, Karl Seng, Keith Leggett, Lisa Geertsen, M. Anne Sweet, Mark Faase, Melinda Hannigan, Michael Nazaroff, Michelle Smith-Lewis, Mike Stuntz, Nika Bavaa, Patrick Kam, Patrick Moss, Patrick Nelson, Richard Lemmert, Roy Wonder, Sam Farrazaino, Sarah Woodson, Sherry Hussey, Stacy Rosevear, Steve Hussey, Syd Shera, Tabasco Mills, Tamara Clammer, Tim Aguero,Trevor Gauntlett. Fantagraphics Bookstore & Gallery celebrates its 6th Anniversary with 30 Years of Love& Rockets with Gilbert and Jaime Hernandez. Music by Geneviève Castrée. Fonda La Catrina will present paintings by Georgetown artist Angelina Tolentino. The Georgetown Arts & Cultural Center has affordable art in a magical setting! Resident artist studios open along with guest artists, selling unique objects of curiosity. Cider and popcorn to the first 50 attendees. Child friendly event. Open 5pm – 9 pm. Georgetown Atelier is hosting their annual Student Art and Holiday Party! View paintings and drawings of current students, enjoy a refreshment and tour the school! The Georgetown Liquor Company is showing figure drawings by Tom Foti. 1) Frida Gallery launches Feather and Blade (www.featherandblade.com), their online market featuring visionary artisans, eco designers & American legends. Collections include Chemical Wedding, Prairie Underground, Jewels Curnow, Rockmount Ranch Wear and a soulful selection of artifacts for the modern forager. and the magic beyond. Whisper the secret word (magic) to receive 10% off any Modern Mystics purchase on Dec 8th. 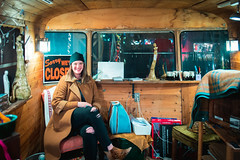 3) Local artist Mary Enslow, Alisa Starr and Amanda Meyers host the Donner & Blitzen Pop-up Shop. 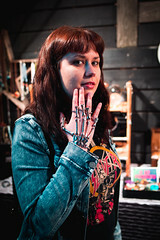 Local creations from Jesse Link, James Lobb and the Snarky Card queen herself. Art finds from afar, such as Montana artist Jarrod Eastman. The gift of art will ensure your loved one will continue to love you for the next calendar year and perhaps beyond! 4) Stock up on nostalgic wares for the holidays at Bitsy Shop Home and gather your eclectic goods for the Zombie apocalypse at Mueller’s Mercantile. Please don’t forget to get your picture taken with discount Santa! Hallava Falafel is presenting local photographer Justin Mumm. Krab Jab Studio presents “The Little Book of Pain” art show and book launch of illustrator Anthony S. Waters. Also featuring art by resident artists Julie Baroh, Mark Tedin, and Gabe Marquez, and artist-at-large Kyle Abernethy. Le’Objects for the Home will have a Holiday Decor open house. LxWxH Gallery celebrates it’s grand opening! Details are here. Mary Tudor and Ferrell Studio is showing beautiful, abstract paintings. Additionally, Ferrell’s work is on display at Georgetown’s Diamonji Sushi Bar at Michigan/Corson S! Located in the Bottling Plant next to Georgetown Atelier! The Nautilus Studio presents ” The Collagemonauts” and their Eve of Destruction with Marty Gordon, Tim Manthey, and Craig van den Bosch. The Nautilus Workshop will be open for art walk and showcase the in-house artists’ newest work in the making. One Night Stand Gallery is hosting unique art and live music. The Roving Gallery is having a Holiday Open House, open from 3pm to 8pm, with music, edibles and libation.Please come see the new art …we are pulling out all the stops! Denise Chandler Smith, Janet S. Crawley, Keli Sim DeRitis and Roxanne Fawcett are showing new and exciting pieces! Sage Artistry presents “Facing the Furnace Part Two: Glass Artists UNITE!”. Far North Georgetown is ALIVE with blends of hot-casted and kiln-casted glass created by a local group of emerging glass artists. Waxing Impressions is showing new beeswax encaustic paintings, watercolors, and acrylics. In addition new paperclay jewelry, diachronic glass jewelry, and beeswax encaustic jewelry by Deborah Stachowic. Also, Tir na nOg illustrated pottery, located in the same space, features pottery by Pamela Hathaway. 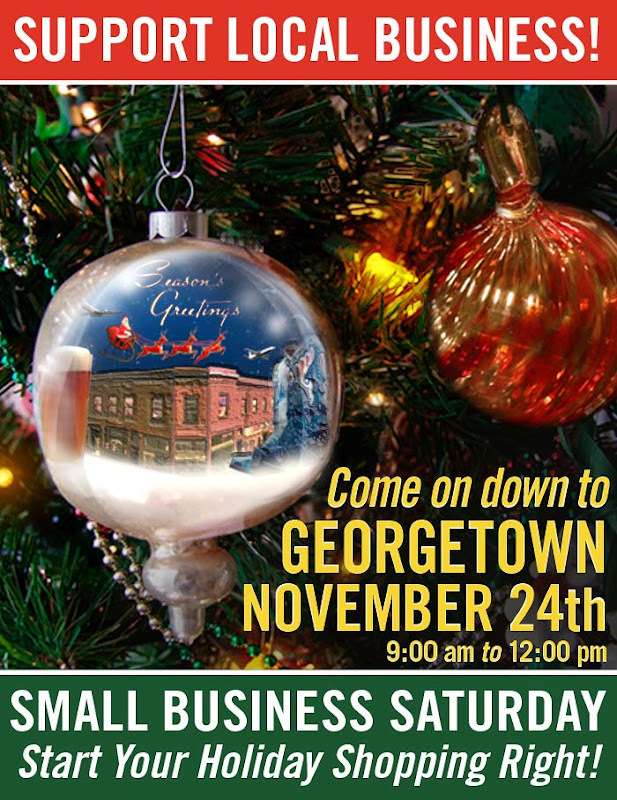 Georgetown’s Small Business Saturday – Shop Local! Support your local brick-and-mortar merchants and studios when you holiday shop! On November 24th, come on down to Georgetown to shop, eat and pamper yourself! If you use American Express, you get a monetary cash back incentive every time you make a purchase to participating businesses! Here’s a sneak peak of the December Art Attack card. 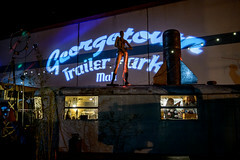 Have you made it to the newly relocated Georgetown Trailer Park? It is a wonderful place. What we have here is a mildly embellished depiction of the steady stream of visitors exploring the local art and merchandise. Let the Holidays Begin at the Trailer Park Mall! 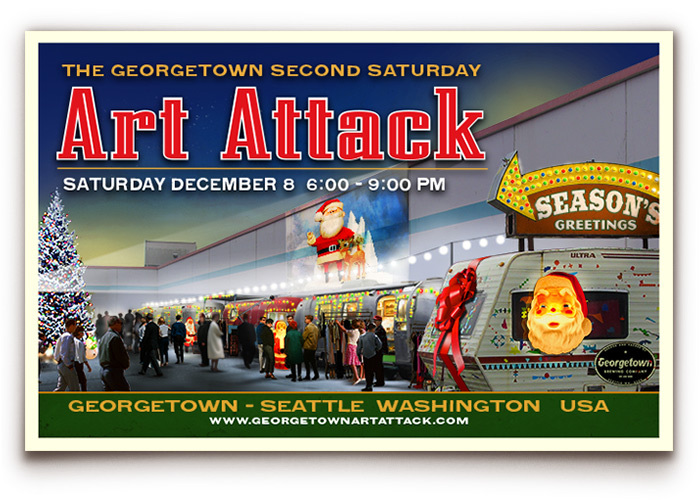 Georgetown Art Attack Saturday December 8th! It’s cold, wet, drizzly Thanksgiving November, and the only thing that keeps you alert (other than your triple grande Americano) is the nagging feeling that you should be starting your Christmas list sometime soon (yeah, already!). Well, Georgetown can help you with that, yes indeed. 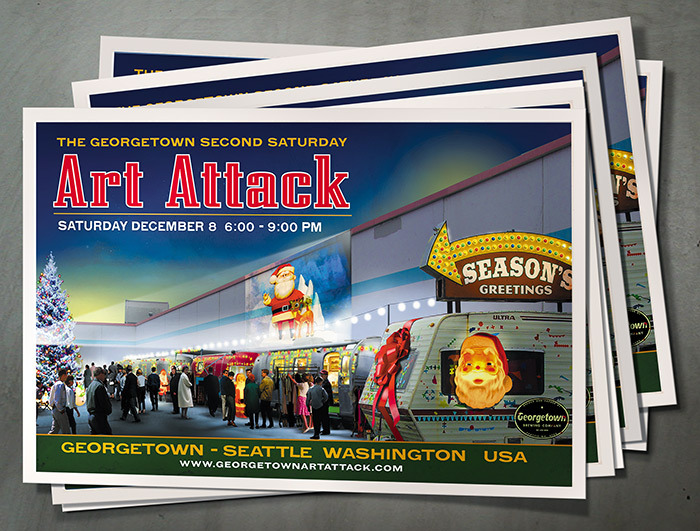 The Georgetown Art Attack art walk, on Saturday November 10th, 6 – 9 pm, has a dizzying array of cool local art (suiting budgets of all kinds), cool local crafts, and delicious beer, wine and food to fuel your hunt for the PERFECT Christmas present this year! Forget the iPad and the wool socks – art is forever. All Aboard the Art Ride! Whether it’s the rain or sore shins that slow you down, the Art Ride bus is ready to whisk you off to your next Georgetown destination! Bus stops are listed on the Art Attack postcard map, and run the loop of Airport Way S to Equinox Studios and back, and best of all… it’s free! All City Coffee continues its show of Guy Merrill and Jess Rees, entitled “Souvenirs”. American Pie and Bakery presents Dave Ryan and his low brow street art stencil vinyls. Calamity Jane’s presents “Industrial Wonderland”, a solo show with new and retrospective works by Mark LaFalce. Alex Miller: videographer and painter, currently painting a special floor to be installed in a movie set. Tamara Clammer: leather mask maker. Make and Take Leather Accessories tonight! Yow! Gini Lawson: oil painter of figurative paintings, Gini is a figure painter extraordinaire. Come see her Sand and Surf series. John Kirschenbaum: WOULD. Ya you read that right. Would. Sophia Wheelwright: assemblage and mixed media.. A naturalist’s eye collects the mundane, the interesting, and fabulous bits of the natural world and encourages us to bricolage as we see fit! Sherry and Steve Hussey: Torch cut steel. Come see their curvilinear designs, cut with a torch from single sheets of steel, into amazing garden gates. Dragonfly garden sculptures too. Mike Nazaroff: Gizmologist and Wizard. Come see his shop and marvel at his machines, tools, dies, lathes, and his knowledge of the known molecular universe. Syd Shera: ceramic art. Syd will be exhibiting tiles that will appear in the Great Equinox Upstairs Bathroom Community Art Project. Must be seen to be believed. Melinda Hannigan: oil painter. Just back from art tour of Germany and Ireland, Melinda regales with stories of travels to a special German art foundation. Oh Melinda will have some stories. Dan Morgan: woodworker and mayor of Equinox. Showing new furniture and toys, Dan will also be taking campaign contributions. Fantagraphics Bookstore & Gallery presents Graphic Biographies by alternative cartoonists David Lasky and Noah Van Sciver. Farewell Paperie, a letterpress studio, showcases a unique line of witty handmade greeting cards, holiday cards, gift tags, and fun paper products. We’ll be doing letterpress demos on our 105-year-old printing press, Bill. Paper lovers, come say hi! The Firm presents “Lost in Transmission”, the collective works of Augie Pagan. This is their last Art Attack before they relocate and we will miss them! Fonda La Catrina presents “Fiddlebone”, original linocuts a la mexicana by Sam Hamrick. The Georgetown Arts & Cultural Center presents painter Nichole Bowen’s “Buddha Ladies”, a powerful expression of creativity and healing after suffering PTSD. Her large scale oil paintings will help fund her lady warrior project to help women in the military deal with PTSD and other traumatic war born disorders. 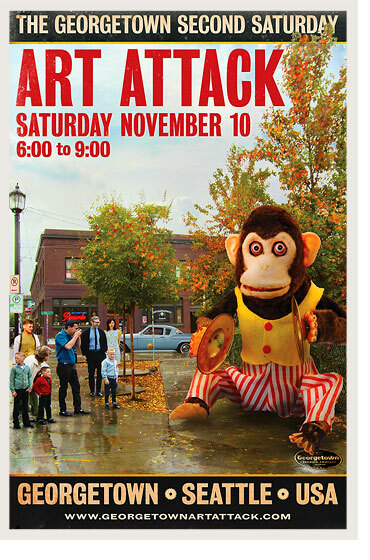 Georgetown Atelier hosts Draw Attack!, a free, fun art jam with a costumed model. Come draw with us! The Georgetown Liquor Company presents the underwater photography of Tom Radio. Georgetown Trailer Park Mall hosts their Homecoming Celebration with live performances by Prom Queen, Pop-up Shops & Special Guests! New location: 5805 Airport Way, between Doris & Homer. Laurelhurst Cellars will be open for wine tasting from 1-9:00 pm, launching their new 2009 Malbec and our 2009 Petite Sirah. Art Ride will make complimentary stops here during this art walk! Le’ Objects for the Home welcomes visitors to stop in and learn the art of creating Holiday Tablescapes. Mary Tudor Studio features Mary Tudor art with environmental, soul calming elemental visuals and Ferrell with visually stunning, spacial and abstract paintings in varying sizes and formats. 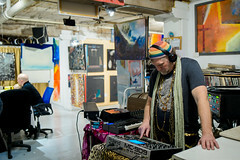 Music by the one and only Luscious Leopard Lips, Georgetown atmospheric music DJ with a Theremin synthesizer. Come in and try it out for yourself. Ferrell’s work also on display at Daimonji Sushi at the Georgetown Center (Michigan and Corson S). The Nautilus Studio presents Matthew Hinshaw’s phantastic sculptural work and mixed media paintings. The Roving Gallery will be featuring guest artist Elissa Stern’s ceramic art and masks. Waxing Impressions is showing new beeswax encaustic paintings, watercolors, and acrylics. In addition new paperclay jewelry, dichroic glass jewelry, and beeswax encaustic jewelry by Deborah Stachowic.